Preheat oven to 400 degrees F (200 degrees C). Line 2 baking sheets with aluminum foil; grease the foil with cooking spray. Place the chicken in a large mixing bowl. Season with salt, pepper, and hot sauce. Add the vegetable oil; toss to coat. Bake in the preheated oven for 30 minutes, turn all the wings, and return to the oven to cook until crispy and no longer pink in the center, about 30 minutes more. Whisk together the garlic, ginger, chili paste, rice vinegar, brown sugar, and soy sauce in a saucepan. Bring the mixture to a boil and immediately remove from heat. Put about half the wings in a large mixing bowl. Pour about half the sauce over the wings. Toss the wings with tongs to coat evenly; transfer to a tray and allow to sit about 5 minutes to allow the sauce to soak into the wings before serving. Repeat with remaining wings and sauce. These were great! I used drumsticks instead of wings but didn't change anything eles. I would have taken a picture but they were gone quickly. 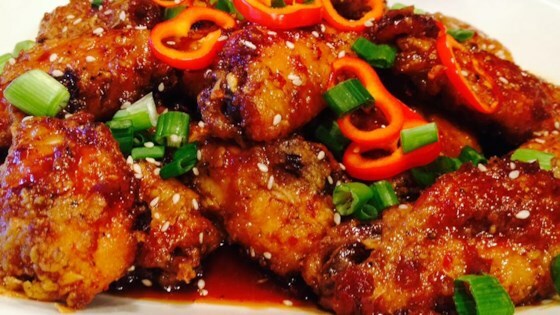 Simple and delicious, I've made these wings several times and they are always a crowd favorite. I add extra garlic, but the recipe as it stands is perfect!